Do you have a backyard or patio space that you are not utilizing? Maybe you have considered transforming it into a functional space that can be enjoyed year-round by you and your family! Outdoor living spaces are a great way to extend your home and enjoy the outdoors more, and more and more homeowners are beginning to turn their boring and bland patio into a relaxing area to unwind in. One feature to consider implementing into your patio design is an outdoor kitchen. An outdoor kitchen makes a great addition to any home, as they create space that will provide you with many options for entertaining and dining at home. 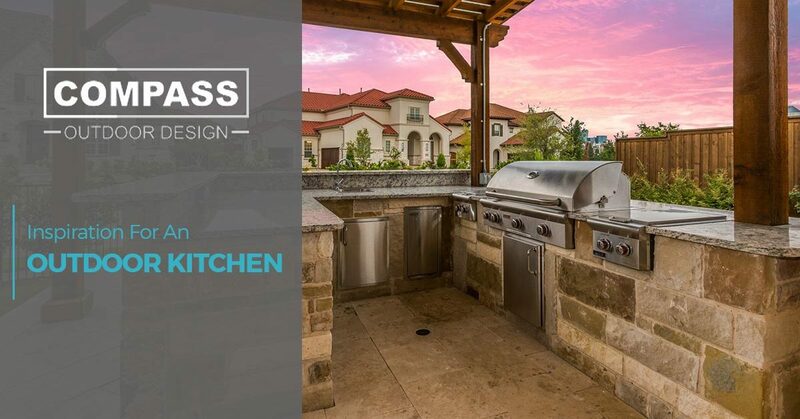 At Compass Outdoor Design, we can help you with the design and construction of your new outdoor kitchen! By working with our patio design company, you will be able to create the outdoor kitchen of your dreams! In this blog, we’ll share some inspiration so you can begin planning for a kitchen that will fit your style, needs, and budget! An outdoor kitchen can really increase the convenience of cooking. In addition to a grill, you’ll want to ensure that you that you include food preparation areas in your outdoor kitchen design. For instance, you may want to install beautiful granite countertops that can be used to chop and prepare meals. By incorporating counter space that can be used for food preparation, you can rest assured that your new outdoor kitchen will be fully functional for your cooking and entertaining needs. As you are designing your kitchen, be sure to consider a comfortable seating and dining area for you and your guests. Cooking outside keeps the heat, smoke, and smells from invading your home, but an outdoor kitchen is ultimately meant for outdoor dining. Be sure to add an area to your patio that can be used to entertain family and friends and eat the meals prepared for them in your outdoor kitchen. Who doesn’t enjoy fresh, oven-fired pies? Believe it or not, pizza ovens are a popular feature that homeowners are adding to their outdoor kitchens. Some homeowners even use them as an alternative or addition to a built-in grill! Not only are pizza ovens an attractive focal point to your outdoor kitchen that can create tasty pizza creations, but they also can be used as a culinary oven so you can cook whatever meal you like. The features to include in your outdoor kitchen are seemingly-endless. Considering how you’ll use the space, where it’s located, and what outdoor appliances you’ll need can all help you design a functional and long-lasting kitchen. When you work with Compass Outdoor Design, our patio designers can help you design and create a new outdoor kitchen that fits your wants, needs, style, and budget. We have helped design and construct some of the best outdoor kitchens in Dallas and the surrounding areas. If you are ready to begin designing your outdoor kitchen or want to learn more information about our design process, contact our team today!